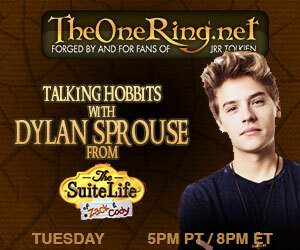 Disney Channel star Dylan Sprouse on TORn TUESDAY *Live* Webcast Today! What are all the young kids reading today? TOLKIEN! Legions of fans who followed the hit Disney Channel series “The Suite Life of Zack & Cody” may be surprised to learn star Dylan Sprouse has embraced his inner-geek, avidly loves Tolkien, and has already seen THE HOBBIT: AUJ four times. Join us on today’s *live* webcast as congenial host Cliff “Quickbeam” Broadway is joined by this special young talent: a Nickelodeon Kid’s Choice Award-winner and T.V. star who’s here to show how generational love of J.R.R. Tolkien is handed down to kids and inspires them to great things! If you’ve got a youngling in the house who’s a fan, they’ll definitely want to join the show *live* and bring their comments to the chat! TORn TUESDAY begins at 5:00PM Pacific Time right here on our Live Event Page, or you can turn on your camera and join in our Stickam hosted page here. You can even watch live from your smartphone using the Stickam App.